I have read and written several movie reviews over the past few years. What I constantly see is how people excel at poking holes in a movie according to their expectations and wishes. I do that sometimes too, but I also think that, when judging a movie, you have to set your standards according to what that movie wanted to achieve. You can easily find that out by searching for what the writer and director wanted to do by making that certain movie. If that vision didn’t transfer properly to your eyes and brain then you can comment freely. “I wish as a young woman I had someone who was not my shrink, not my parent, but a wonderful person watching my back”. That is exactly what she did with Robert De Niro’s character, Ben Whittaker: a charming 70 year old widower who, as he clearly states, has tried everything from travelling to gardening to learning a new language, but did not manage to fill the void he had in his life. So, when he saw an announcement for a senior internship at a company called “About the fit”, that sells clothes online, he fully goes for it. The company’s owner, a 30-something year old woman named Jules Ostin, played by Anne Hathaway, is pretty reluctant at first, but obviously he turns out to be a blessing in her life. As you can tell, Jules is a very busy woman who struggles with the challenge of maintaining a work-life balance, being the founder and leader of a fast developing company and also having a daughter and a husband who has given up his professional life to be a stay-at-home dad. She is also faced with pressure from the “suites” to consider the option of handing the ropes, of the fast-growing company, to a CEO that is more experienced. Things are not exactly running smoothly for Jules who already has every minute of her working day planned carefully and thus hardly even finds time to eat or rest. Of course, the story has flaws if you want to point them out: the “working, successful woman not fully appreciated” theme could have been explored more, the story is kind of idealistic in terms of development and some of the younger cast could have gotten more spot light, but the real focus here is obviously the relationship between Ben and Jules. The relationship proves endearing and also provides moments of very tasteful humor. There are two specific scenes that might turn the waterworks on and both have Ben and Jules in them: one where Ben confesses something unexpected to Jules about his job of many years and one where Jules confesses to Ben about a tough situation and the fears she faces. 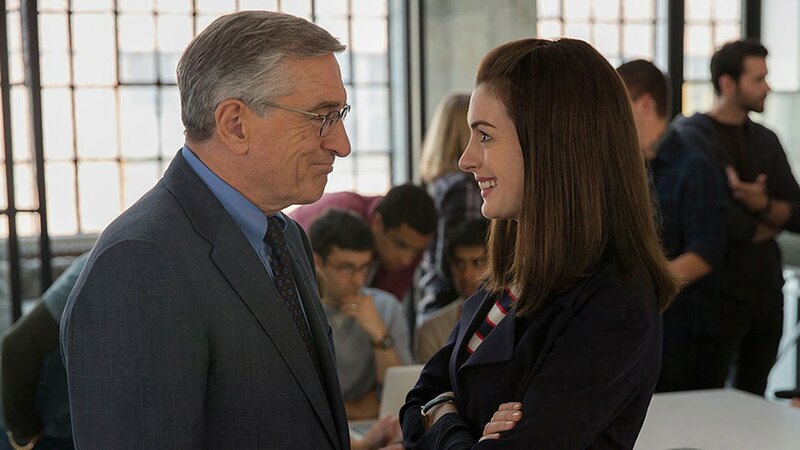 Thankfully, Anne Hathaway and Robert De Niro have great chemistry and they play their roles in a wonderful manner. Robert De Niro is making you wish you had a “Ben” in your life to provide words of wisdom and the emotional support that only an experienced human can give to you. I connected to the movie’s theme of the need and advantages of having someone close that is neither family, nor a therapist, that is there for you for support. A sort of mentor if you will. If you find that person keep him/her close because they are very valuable. Also, Anne Hathaway’s character is pretty motivational in her true dedication for every aspect of her business and for the love she has for it. The movie’s moral is also worth taking into consideration: Hold on to what is dear to you, do not let go of what makes you happy and work hard for what makes your heart grow and sets your soul on fire. Therefore, let’s not ask much more of this movie and enjoy it for what it is. It does its job of leaving you equally entertained and positive about things, against all the holes you might want to poke in it. Take it for what it is: a light, tastefully done, heartwarming kind of story that you would probably enjoy in multiple doses.